“I’ve been discovered. What does one wear?” Gerald Murphy. First the print magazine, now the online mention. So glad that they chose the “clean desk” photo. 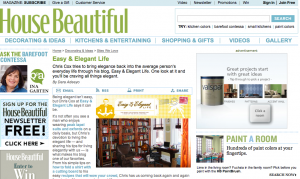 Thank you again to “House Beautiful” and to Shax Riegler who first contacted me. As I can’t possibly afford to replace my hat wardrobe, I won’t let it swell my head. Welcome to those of you who have come over from the House Beautiful site. It’s strange, I know. I’m not really out to write a design blog. Rather, I am exploring what it takes to live life a little more elegantly every day. I hope you’ll join me on my search for an easy elegance and pass along your tips in the comments section (and be sure to read the comments; they are very instructive and often very amusing.) In the meantime, check through my archives and see if Easy and Elegant Life is to your liking. I hope so. This entry was posted in Uncategorized and tagged Gerald Murphy, House Beautiful. Bookmark the permalink. 10 Responses to I’m All Sally Fields. As a long time reader and fan this comes as no surprise – congratulations! The link from the House Beautiful site has been there for over a week. That’s how I found you… and now I’ve caught myself up on every single post that you’ve ever written! Easy and Elegant Life is fabulous and I love it! Thank you so much. This blogger is “beaming” with great pride! Hello and Welcome AimeeInMs, who knew? Glad you’re enjoying the site. A most deserved honor. Congratulations. That is just so NIFTY! With all of the blogs around, you should indeed be very proud. What does I am all Sally Fields mean? Is there a way to sign up for your blog?